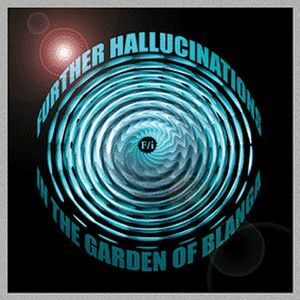 F/i - "Further Hallucinations in the Garden of Blangha"
Instrumental Space rockers F/i are back with their first release in a few years and this is a vinyl only release in 300 copies in a triple fold out sleeve with pasted on sticker art. The A side is all new studio material and one live track and the B side is 2 live tracks. Side A starts off with the track The Circle is the Square, which is the title of one of their very old cassette tape releases. This is for sure different and features some nice guitar playing by Brian Wensing (it could also be Richard but he is laying down the bass). A nice melodic but spaced out sound. Shadow Vision is more psychedelic and spaced out with the groove less focused. The Hallucination Song has with some flute and acoustic guitar and minimal drums. A very cool track and totally different. Side A ends with The Garden of Blanga in the Morning Dew which again is more laid back and spacey. Side B starts with In the Garden of Blanga and has a has a very cool hypnotic groove and spacey electronics. It even has a bit of Spanish element to it but this guitar is a bit buried. Next up is In the Garden of Blanga and this leads into Improvisation. Jamming space rock stuff. A very cool release.